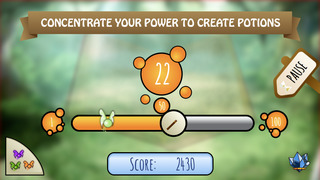 Magic Wanda - Be precise and create potions with the help of your magical fairies! In Magic Wanda the objective is simple, but difficult to master. You have to put your wand in the position of the bar according to the amount of mana you need to use in each round. If you can hit the number, you will create a potion! There are 4 different types of potions. The more you have, you will get better achievements. Still, if you do not get to create a potion, as you get close to the amount of mana needed, you get points. Try to get as many points as you can and be the best magician in the world! Simple and fun! Are you ready for the challenge?